Has aged rather well, the cycle of this, Undermine, Suffocating Blast, and Mystic Snake are all pretty good cards to this day. One thing that bugged me is that Invasion block had a cycle of counterspells in blue and a cycle of "mutations" in green, but no black, red, and white four-card cycles. The counterspells have held up, especially Mystic Snake, because blink. The mutations, I've actually won Commander games off Artifact Mutation (with Parallel Lives and Purphoros, God of the Forge out, targeting Blightsteel Colossus), and Aura and even Æther are still playable. Death Mutation, however, has never been playable. Didn't expect this, this is pretty huge. 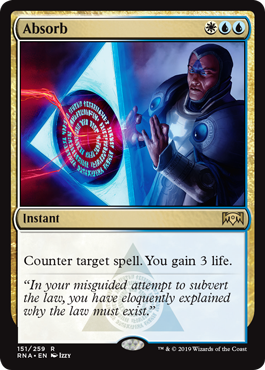 Incredibly good counter and with hallowed fountain coming in this should be easy enough to play in a UWx deck as long as blue is the main colour. Arguably the best 3 mana counter there is if you can handle the mana.